Have a great kitchen design in mind but lack the expertise to execute it? Go for a kitchen cabinet plan, that will lend elegance to your overall design and also help you control costs. 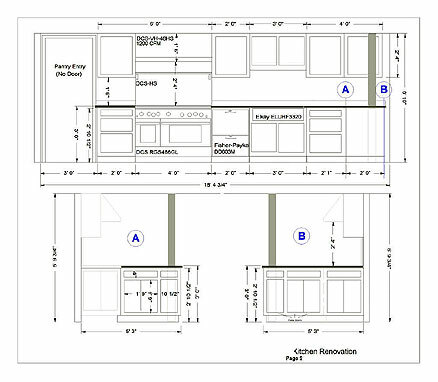 How do you get the kitchen cabinet plan for your kitchen? Since cabinets occupy the maximum part of kitchen, they ought to be planned and designed properly. Even if you think you can craft some great cabinets yourself, it is always better to first check the plan with a professional expert or even your local kitchen hardware store. And if all this is a hassle, just go for some Internet research and a computer generated plan that best suits your kitchen space and style. Once you are able to design a kitchen cabinet plan or get one from either a professional or computer, you should decide on how you want to get it in place. If you have good experience of woodwork, then you may wish to start on your own. However, be sure about the measurements and the immense amount of work that will follow in crafting out kitchen cabinets on your own. Getting a carpenter to do it may turn expensive but you can be sure of accurate fittings and a good end result. Next level of work would entail deciding on materials for your kitchen cabinets. Whether it is exotic wood, glass or plastic you ought to choose them based on your style, budget, durability and also how well your walls can take the load. You can always consult a professional in case of doubt or just survey at your local kitchen hardware store. Do you have the required equipment? After the kitchen cabinet plan and materials have been decided, you need to know what tools and equipments would be required in case you are making the cabinets yourself. Go through the operating instructions for all these tools in order to be able to use them properly. It can be a host of equipments to use, from drilling machine, saw to small nuts, bolts etc., so you must be sure of their usage and safety too. Otherwise, a carpenter can always be put to work. What if you have existing kitchen cabinets too? If there are existing cabinets in the kitchen, they may have to be first uninstalled and space made for new ones. This can be complex as you may have decided on a new kitchen cabinet plan of arrangement, which would require new measurements on walls and floor. Hence careful re-measurements may be required. 1. A quick wall cleanup will allow you to neatly mark lines and points that are required for new kitchen cabinet installation. 2. While installing new kitchen cabinets you may have to adjust and re-adjust the positions for a proper fit of the cabinet set, so try not putting doors or permanent fixing of screws. 3. While planning your kitchen cupboards, ensure that the sink, refrigerator and stove are in a triangular formation. Also, the dishwasher and sink should be next to each other while oven and refrigerator should not be. 4. Ensure appropriate lighting in all areas and especially in important work areas e.g. sink. 5. As a general rule, the width of cabinet doors should be less than their height. So, in some cases you might have to go for double-door kitchen cabinets. 6. Ensure that the shelf height is such that you (and others who would be working in the kitchen) are able to reach it easily. 7. Use false fronts for areas like below the sink, etc. in order to give a consistently good look to your kitchen. 8. Leave around 1.5 feet counter space where the refrigerator door opens and similar space for other appliances that would need that space for ease of operation. A cost analysis of all the options should be done by comparing the various material costs and services of a carpenter or professional expert. Take your time before you head for any decision as a good planning, designing and execution would ensure your kitchen is all about that you dreamt of. Plan3D online kitchen planner – This kitchen design software automatically creates blueprints with dimensions for you – as well as elevations and overheads. Good article! If I need a plan for my kitchen then I will need this information. Hi Ganka… was just browsing through the Internet looking for some information on kitchen cabinet plans and came across your blog. I am impressed by the information that you have on this Kitchen Blog. Thanks. Thank you for your comment, Bill.